Dr McCormick will return to give more evidence to the inquiry next month - the chairman Sir Patrick Coghlin jokes with him: "I'm sure you can hardly wait... do your best!" Tomorrow's inquiry proceedings could be blockbuster stuff, with Jonathan Bell due to take the oath and give evidence for the first time. You can do your revision ahead of that by reading his witness statements - they're available on the inquiry website. A senior civil servant said that he does not "recall any resistance" from DUP advisers to the RHI scheme being placed on the agenda during ministerial meetings. The former enterprise minister Jonathan Bell had made the claim in his witness statement, which was published this afternoon. But Dr Andrew McCormick, the top civil servant in the department that ran the energy scheme, said he had no such memory of that ever happening. "That's the kind of thing I would remember," he added. Dr McCormick says in his witness statement that there was a "breakdown in trust" after the events in London and that "made the difficult RHI issue significantly harder to resolve". Mr Cairns recalls in his evidence to the inquiry that he went to the DETI permanent secretary with concerns about Mr Bell's behaviour. He says in his statement that Dr McCormick told him that he could only act in relation to civil servants and there was therefore nothing he could do. Asked if he remembers that happening, the witness says he's been "scratching my head" about whether it did. "I think I would remember Timothy coming saying: 'You need to help me with a bullying problem' - I don't recall that." The "tacit understanding" was that the dispute between Mr Bell and his adviser was a matter for the DUP rather than the civil service. Mr Bell "got very cross" over breakfast in London because he didn't want to have to refer his ministerial decisions to others within the DUP, says Dr McCormick. The relationship between the minister and his adviser "visibly wasn't" a good one, he adds. The was a "very abrupt tone" but it "didn't cross a line into abusive". There was a "pretty sharp" exchange between Mr Bell and his adviser over breakfast in London in June 2015, according to Dr McCormick, but he did not see anything from either man that was threatening or intimidating. Mr Cairns believed he'd been sacked after the row. Dr McCormick says the minister told him afterwards that Mr Cairns wouldn't be attending the meeting with the energy minister. He texted the DUP adviser Richard Bullick to say he was "sorry to hear of the issue between" Mr Bell and Mr Cairns, adding: "Not sure if I can help but do call if you wish." He tells the inquiry that he didn't have much detail about what had happened beyond knowing that the "flare-up" over breakfast had "turned into more of a personal disagreement". Mr Cairns has alleged that Mr Bell acted in "an intimidating or a threatening way" on several occasions, says the inquiry barrister, who adds that it's "sensitive territory". Mr Scoffield makes the point that Mr Bell "takes issue with what is alleged". The DETI minister, his adviser and the department's permanent secretary went to London for a meeting the then energy secretary Amber Rudd on 10 June 2015. The night before, Mr Bell and Mr Cairns went for dinner in an Indian restaurant and there was a discussion of work matters. Dr McCormick wasn't there but he was later told that Mr Bell had made it clear that he wanted to bring the scheme under control. Mr Cairns has told the inquiry that he had been urging Mr Bell to listen to advise from his successor Arlene Foster and her adviser Dr Andrew Crawford, given that they had experience of the scheme. The response Mr Cairns says he got from Mr Bell was that it was he who ran the department and he would make the decisions. The inquiry has heard from Mr Bell that the RHI scheme was not discussed that evening. There was a "working assumption" at DETI that because Mr Bell and Mr Cairns had worked together before officials could take their lead from the adviser, says Dr McCormick. Officials worked on the basis that submissions for Mr Bell always went to the adviser and that they could only get access to the minister through Mr Cairns. The two men had an established working relationship but it was a tense one at times - evidence given to the inquiry outlines numerous rows between them. Mr Bell refers in his witness statement to a comment he says was made by his adviser Tim Cairns in Dr McCormick's presence ahead of an meeting they had. He says Mr Cairns referred to fellow DUP advisers Dr Andrew Crawford, Timothy Johnston and John Robinson "not wishing the RHI to be on the agenda". Dr McCormick says he has no recollection of such an observation being made. "No mention in those contexts of Andrew Crawford, or Timothy Johnston, or John Robinson - that bears no resemblance to my memory," he adds. In his evidence to the inquiry, Mr Bell says that the specifics about the RHI scheme's overspend weren't drawn to his attention in June 2015, a few weeks after he took up his ministerial post. Inquiry counsel Mr Scoffield asks if there was any "desire to keep the figures away from the minister". Dr McCormick says he can't "see any basis for any reticence" or a reason "why anyone would withhold that fundamental". The funding "should have been provided in a straightforward way", he says, adding: "Jonathan Bell may have a point on that." Ahead of his appearance at the RHI Inquiry tomorrow and Friday, Jonathan Bell's written statements have just been published. There are three in total - click here for the first, click here for the second and click here for the third. Dr McCormick takes his jacket off as the inquiry moves on to a discussion about a meeting with the then DETI minister Jonathan Bell in June 2015. The witness took part in the meeting along with other department senior managers and the minister, and the RHI scheme was on the agenda. But the minister wasn't give a written briefing about the scheme, even though by that stage the problems it had encountered were needing urgent attention. Dr McCormick accepts that there's "no good reasoning" not to have provided Mr Bell with at least background. It "didn't register" with Dr McCormick how "radically novel" the RHI scheme was, he says. But inquiry barrister Mr Scoffield tells the witness that he knew in June 2015 that the scheme was over its budget, that there had been a sudden increase in applications and spending approval for the scheme had lapsed. He suggests that was a "classic opportunity for a step-back moment" to examine what was the causing the problems. Dr McCormick says that didn't happen because DETI "rushed our fences" in trying to solve the problems straight away. Senior management at DETI met at the end of May 2015 to discuss problems with the RHI scheme and there was a "sharp exchange of views" and "strong words" between officials from the energy and finance teams, according to Dr McCormick. The debate was "getting a bit destructive" and he had to intervene. The dispute stemmed from the length of time it had taken the finance team to provide clarity to the energy team about the budget arrangements for the scheme. Energy officials had asked for help to understand the funding in March that year - they didn't get a response for weeks. Dr Andrew McCormick gave a briefing to his DETI staff in May 2015, explaining that there was a plan to introduce changes to the RHI scheme by October that year. Officials wanted to give the renewables industry three months' notice of the changes - the inquiry barrister David Scoffield QC suggests that demonstrates a lack of commercial awareness on their part. "It shows to me a greater emphasis on avoiding legal challenge," says Dr McCormick. "We have lost a significant number of judicial reviews through a lack of good process." Missed The Nolan Show this morning? Then you missed some more eyebrow-raising details about the RHI debacle. Evidence given to the RHI Inquiry shows that another relative of the adviser to the DUP leader Arlene Foster applied to have three biomass boilers registered on the scheme just before cost controls were implemented. As the News Letter's political editor Sam McBride told the show, it's already been revealed that Dr Andrew Crawford passed confidential papers warning of imminent changes to the scheme to two relatives but now a third has emerged. There were also some fascinating details about secret recordings made by the former DUP minister Jonathan Bell as the scandal around the scheme was erupting in December 2015. You can listen back to the programme by clicking here and you can read Sam's article for today's News Letter by clicking here. It is the scandal that sent Northern Ireland's devolved government up in flames and risked leaving taxpayers hundreds of millions of pounds out of pocket. 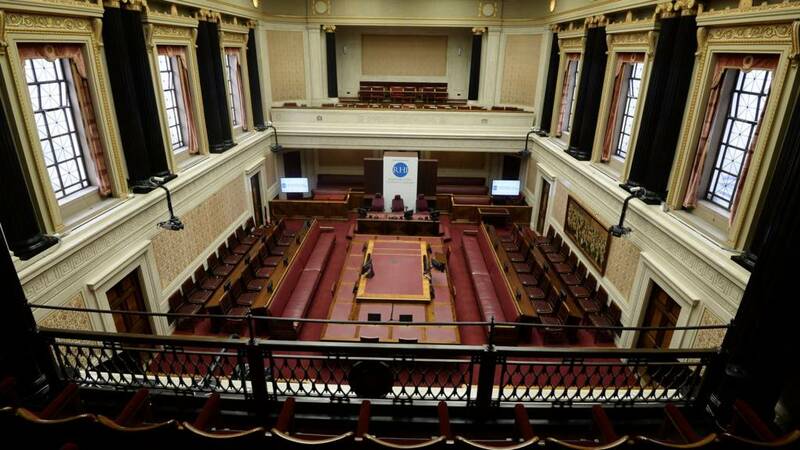 The RHI debacle has exposed serious flaws in the region's civil service and governance systems. BBC News NI has followed every minute of the inquiry into the scandal since it started last autumn. Click here to read of our review to some of the major revelations that have emerged so far. The Senate chamber empties as everyone heads downstairs for a bite to eat. The inquiry resumes with more questions for Dr McCormick at 14:05. Inquiry panellist Dr Keith McLean asks if the witness agrees that "value-for-money considerations don't seem to have been a primary issue for any people" involved in the RHI scheme. Dr McCormick's view is that there was a "working assumption that this was a good scheme". "There was a sense of something inherently good" in that the scheme was helping Northern Ireland to meet important targets for increasing use of renewable energy, he says. But he admits that "does not take away one iota the responsibility to ensure that the means of moving towards those outcomes was actually effective".